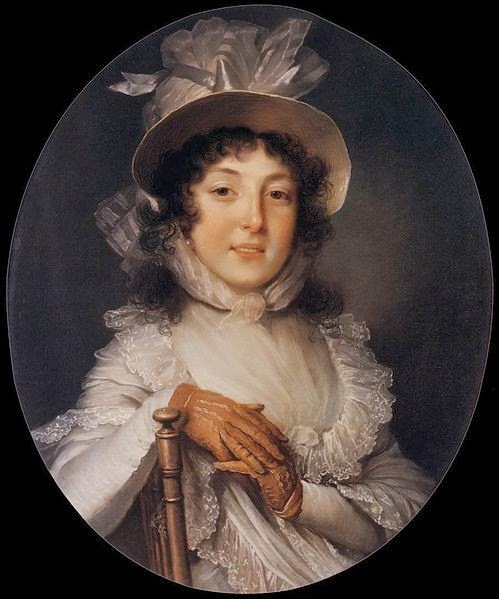 Rodama: a blog of 18th century & Revolutionary French trivia: Is this the face of Marie-Antoinette???? Marie-Antoinette in the Temple prison, by Alexandre Kucharski. Oil on canvas. 58cm x 68 cm. Described as in a "Parisian collection". 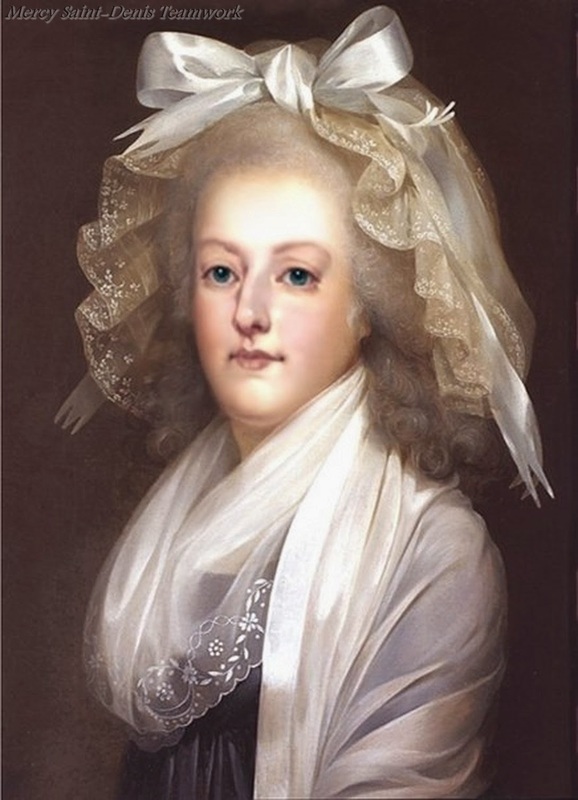 This startling and hitherto completely unknown portrait of Marie-Antoinette is now much reproduced on the internet. The origin of the images seems to be the book Portraits des femmes (2006) by the Olivier Blanc, who is a well-known French art expert and freelance historical writer - the picture features prominently on the cover of his work. 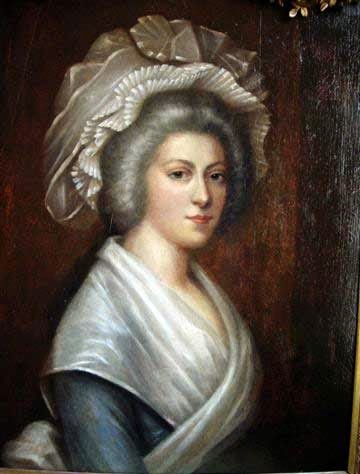 According to Blanc (p.171-4) this is an uncatalogued portrait in oil, by the court painter Alexandre Kucharski, painted at the Temple some time after 10 August 1792 and showing Marie-Antoinette in semi-mourning costume following the death of the Princesse de Lamballe. It is known the Kucharski gained access to the Temple to sketch his famous last portrait of the Queen, so the presumption is that this represents an earlier sitting, worked up into a finished portrait in the studio, possibly at a much later date. Blanc, who has clearly examined the picture, says that the frame gives no clues to dating within ten years; possibly it is as late as the end of the Directory or even the Empire period when Kucharsky's reputation was revived by his portrait of the singer Madame Barbier-Walbonne. The flesh tones and use of white silks in the two paintings perhaps suggest a similar date. Although the painting is listed by Blanc only as belonging to a "Parisian collector" the owner can easily be discovered; it is none other than Jacques Larcia, fabulously rich interior designer, and leading force behind the restoration work at Versailles. It hangs prominently in the salon de compagnie of his sumptuously refurbished Château du Champ-de-Bataille in the Eure. Unfortunately, despite Larcia's penchant for self-advertisement, there is no information on exactly how he acquired the work or where it might have been hiding for two hundred years. It seems odd that a dozen or copies exist of Kucharski's last portrait of Marie-Antoinette - Kucharski himself made a cottage industry of reproducing it - yet this much more elegantly finished image has remained completely unknown. The fact in itself, however, suggests a relatively late date of composition. Detractors have looked desperately for reasons to doubt the picture's authenticity. There is a good discussion on Le forum de Marie-Antoinette where "Cosmo Ramirez" is a reluctant but particularly well-informed defender. 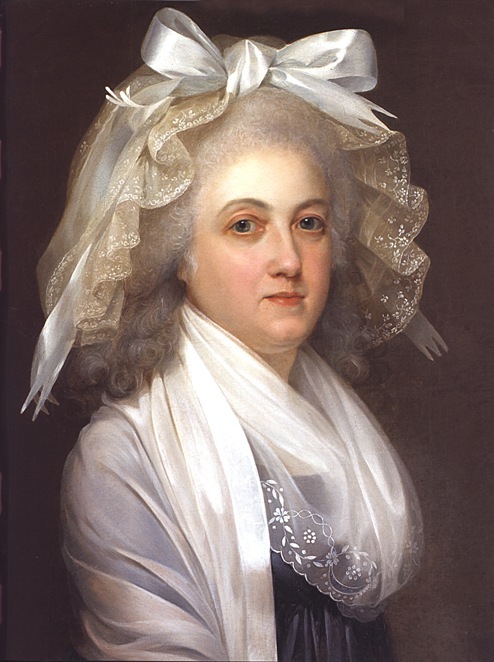 Contributors have queried (among other things) the empire-line dress, the silly hat and the white bow, but there is a very similar bonnet in Kucharski's late portrait of Madame Élisabeth in the Temple. Cosmo has even come up with documentary evidence for the bow as part of a conventional mourning outfit ("le petit deuil") worn by the Queen on an earlier occasion. A picture by Jean-Jacques Hauer depicting Louis XIV's final farewell to his family shows Marie Antoinette with very similar long frizzy hair. So much for the props, but what about the face? In comparisons with earlier portraits or with portraits of the Empress Maria Theresa, the picture again fares reasonably well. You can find noses and mouths that are very similar. The main stumbling block is probably those big doleful, slightly reproachful eyes, which create a suitably sorrowful mine, but seem quite unlike other depictions. Here is the portrait (flipped) compared with other Kucharskis. Personally, I do not like this picture - it reminds me too much of a great-aunt of mine, who suffered from a slight thyroid condition. 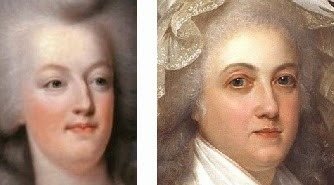 Marie-Antoinette has the same slightly pursed, disapproving mouth and tendency to double chin. Such a beautifully finished painting also makes her seem a little too plump and glossy to inspire pity. I agree with Cosmo - this is indeed intended to be Marie Antoinette, though probably it was painted at some remove in time; and, whatever its accuracy as a likeness, as a work of art it fails to satisfy the imagination. 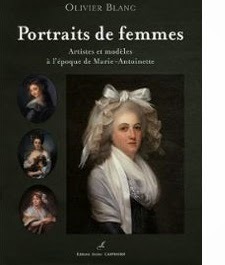 Olivier Blanc, Portraits des femmes : artistes et modèles à l'époque de Marie-Antoinette (2006),p.172-4. 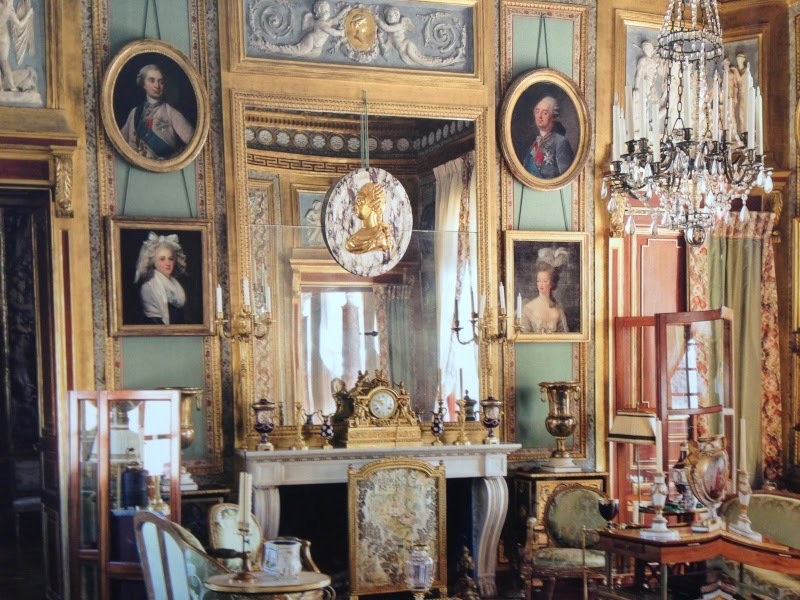 On "Le Boudoir de Marie-Antoinette"
This digitally altered image has recently been posted on Pinterest; it would be more useful if there was an explanation to go with it - maybe it incorporates data from another portrait to show the overlap? Is it possible that it could be a portrait of a now-unidentified widow who has been renamed to make her more saleable? Just a thought.